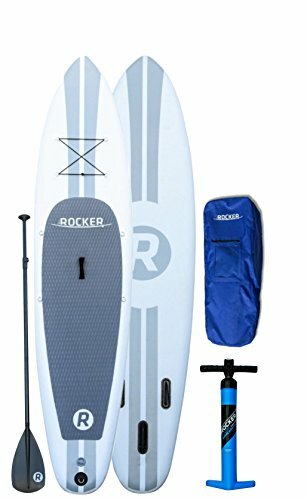 The iRocker Paddle Board is made with high quality materials as it uses military-grade material. It is reinforced with an internal 6” triple layer dropstitch design making it more stable than ever. 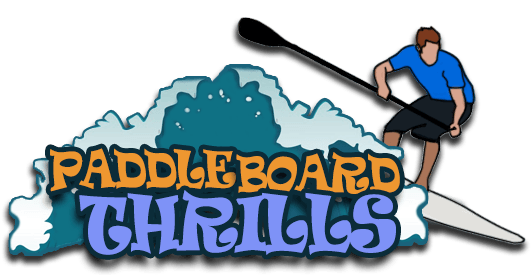 The design of this board is made with the consideration for novice paddlers. 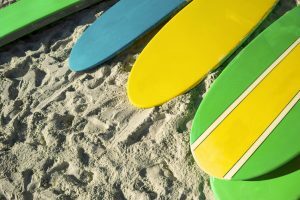 Now, you’ll never have to settle for an expensive hard board because this specific model can be as durable and functional as the usual hard boards when fully inflated. This model looks solid exactly like a hard board when inflated to 15 psi. It is also sturdy, thanks to its high-quality military-grade dropstitch material which is made of three 6” thick layers. This enhances its strength against impacts from rocks, wood pilings, and concrete. You can maneuver this model quite easy even if you are a beginner. You can sit while riding on it or you can stand if you are already experienced with this activity. 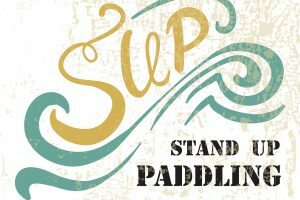 You can use the adjustable paddle to help you maneuver the board while standing. Extend its length in accordance to your height. The side fins make it easy to work against the water, while the center fin helps you remain stable. The hand pump that comes with this package is a high-capacity dual action unit which makes it easy to pump. The pressure gauge that is integrated with the device makes it easier for you to choose the recommended psi, which is 15. You can inflate the board in less than 20 minutes on average. You can carry this board to any location by keeping its deflated form in the backpack. This saves space inside your vehicle for other essentials. You can store it away for another season in your garage or attic. A few customers noted that the valve seem to be weakly made because it easily leaks. This is such a bummer if this happens to you in the middle of your paddling experience. If you happen to have the same issue, you can loosen the valve and retighten it again. Maybe regular inflating loosened the valve in the process. 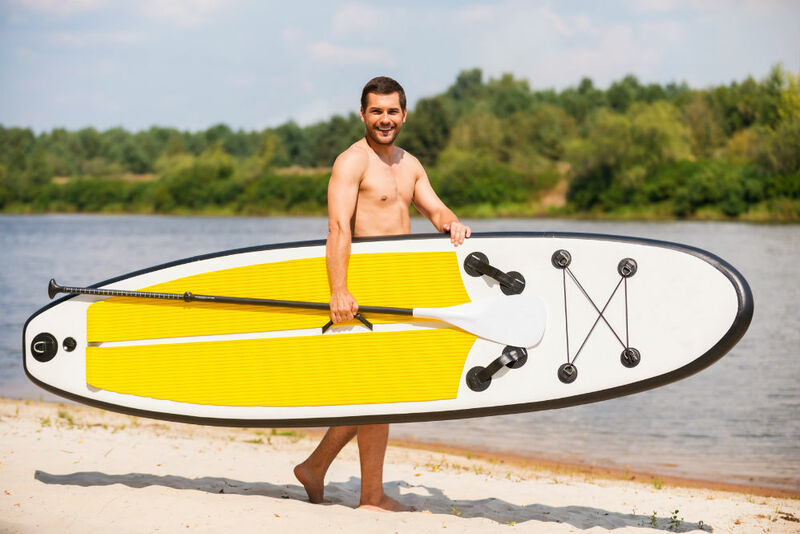 Unlike all other inflatable paddleboards, this unit has no repair kit among its accessories. It would come in handy if you met an unprecedented accident. Though this may be the case, it is not a deal breaker for the quality. If you want a repair kit, you can try other brands which offer this in their package, like the ISLE Airtech 12’6 Touring Inflatable Stand Up Paddle Board. 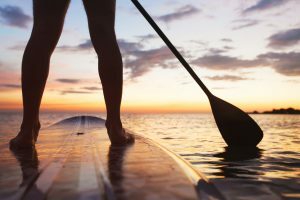 Since the paddle is made of aluminum, it is a little heavy to operate especially if you are paddling against running water. This was the concern of a few customers who are beginners in the field. 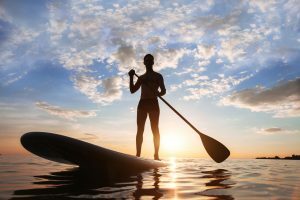 If you want a lighter paddle, try the Ten Toes iSUP Inflatable Standup Paddleboard. 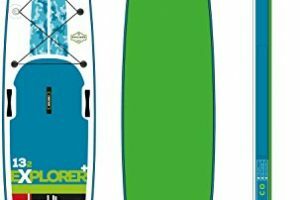 This model is a great paddleboard for beginners with the 3 fins providing great stability in the water. It is also portable and durable with its high-quality military-grade materials. Although this may lack a repair kit, it is set off by its 2-year warranty service. 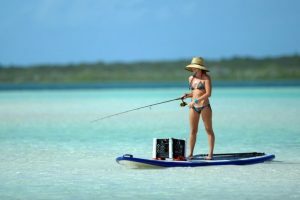 As compared to the ISLE Airtech, the iRocker Paddle Board can take more weight up to 350 pounds while the other brand can only support up to 275 pounds. Though both offer the same 2-year warranty, the iRocker lacks a repair kit that its rival brand offers. The iRocker is also heavier than its counterpart, but it has a more efficient inflation pump. 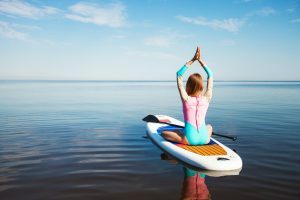 In comparison to the Vilano Voyager, the iRocker paddle board offers a higher warranty service of 2 years, while its rival only offers a 1-year warranty. In terms of construction, both have the same high-grade dropstitch material quality. Although both lack the repair kit that other brands offer, the iRocker is lighter than its rival by around 13 pounds. Hi Dave, we located the following product.